A note arrived in my inbox today announcing a ten day-long charity benefit for the Michael J. Fox Foundation for Parkinson's Research. 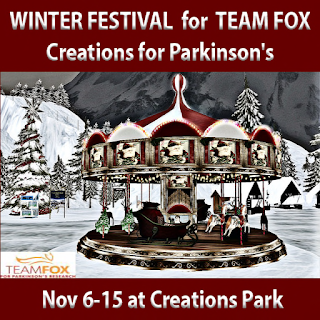 The Winter Festival benefit is being held at Creations Park from November 6 - 15. It includes shopping, with products provided by some of SL's top designers including BamPu Legacies, Blue Moon Designs, and Kari's Kreations. There's also live music and DJs, including Seth Regan and over 25 other live singers. There's a Hunt, free gifts, and amusement rides from Dutch Amusement Rides and Entertainment. And, for your Winter enjoyment, a sim-wide ice skating area! It's a privilege to be part of such a worthy cause. My little 7 year old boy Aden is a huge Michael J. Fox and "Back to the Future" fan. When I told him I was going to headline this Second Life event, he put his hand on my shoulder and said "Daddy it's good you're going to help him." Of course I explained it wasn't just MJF I was aimin to help but also to let lots of other people KNOW about Parkinsons so that they might make a donation to help with research. Aden is a very bright 7 year old and he understood.